The revived 2011 production has some new visual touches, an excellent conductor in Julia Jones and nimble singers who bring Mozart’s enchanting, humorous tale to vibrant life. Ask any Seattle Opera fans for their favorite productions of the past decade, and you’re likely to see “The Magic Flute” on the list. The 2011 production, a brilliant collaboration between the forces of design, direction and music, has returned to McCaw Hall, much to the enjoyment of audiences at this past weekend’s first two shows. Returning stage director Chris Alexander has added several new touches to the clever, imaginative staging, and the work of the visual team (designers Robert Dahlstrom and Robert Schaub, lighting designer Duane Schuler) continues to delight the eye. There’s a new conductor in the orchestra pit — the excellent Julia Jones, in her company debut — who gracefully supports the singers while crisply illuminating the score with all of its humor and pathos. And Jonathan Dean’s wonderfully colloquial projected captions have a few witty new twists (a line that included “fake news” caused gales of laughter in the audience). The show’s charming visuals, heavy on pyramidal and Egyptian themes, are enhanced by the brilliantly colorful costumes of renowned British designer Zandra Rhodes, who supercharged every scene with vivid and iridescent images. by Wolfgang Amadeus Mozart. Julia Jones conducts, staging by Chris Alexander, sets by Robert Dahlstrom and Robert Schaub; through May 21, tickets from $25 (206-389-7676, seattleopera.org). It’s always exciting when the Queen of the Night steps forward for her two killer arias, and Christina Poulitsi proved more than capable of Mozart’s stratospheric vocal challenges. She sang with uncanny power and accuracy right up to the high F’s, which were stunningly good; Poulitsi also is a powerful actress who knows how to use her voice as a weapon. At the other end of the sonic spectrum, the resonant, resounding bass Ante Jerkunica made Sarastro’s arias among the production’s high points. Saturday night’s principals included Andrew Stenson as an ardent, animated Tamino, and Lauren Snouffer as an artful Pamina (her “Ach, ich fühl’s” was particularly fine). John Moore’s hilariously active Papageno provided ongoing comic energy; Papagena was the excellent Amanda Opuszynski. Rodell Rosel found admirable balance in the tricky role of Monostatos. Taking over on Sunday were Randall Bills, a first-rate tenor who illuminated Tamino’s nobility and ardor, and Amanda Forsythe, a Pamina of lyrical delicacy and vocal subtlety. Craig Verm was an adroitly funny and vocally nimble Papageno. The principal singers were discreetly miked for the spoken dialogue, according to Seattle Opera staff, but never for the singing. The charm quotient of this production was raised by the supporting cast — particularly the Three Spirits, who dash about on their silver skateboards and advance the plot with beguiling humor (and excellent singing). On Saturday they were Johanna Mergener, Emili Rice and Isabel Woods; on Sunday we heard the trio of Emily Amesquita, Alyssa Khela and Barrett Lhamon. The three ladies, all excellent, were Jacqueline Piccolino, Nian Wang and Jenni Bank. Adam Lau was the Speaker; Eric Neuville and Ryan Bede were the Priests, and the two Armored Men were Frederick Ballentine and Jonathan Silva. The chorus, prepared by John Keene, sang admirably. The show’s only false note came in the last moments of the triumphant finale, when a sudden bid for freedom in the midst of the celebrations felt tacked-on and ill-advised. 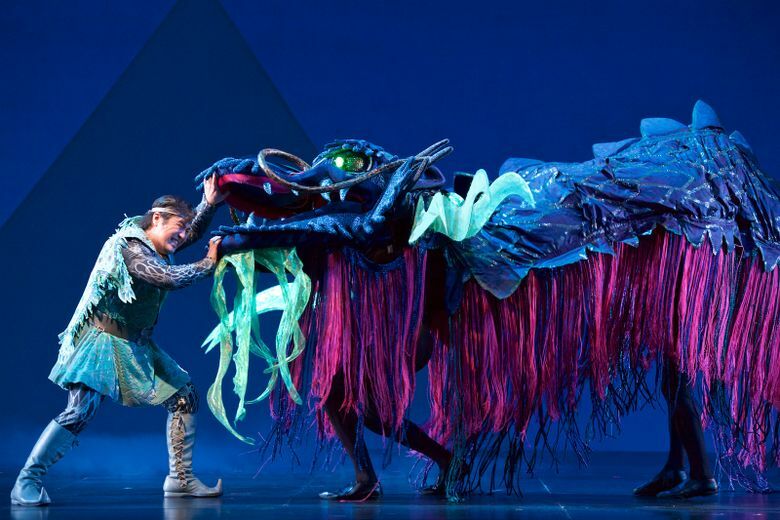 Seattle Opera suggests the production is appropriate for ages 5 and up, and I would concur — provided you have a 5-year-old who can sit and pay attention for two acts of about 69 and 83 minutes, respectively (there’s a 30-minute intermission in between). It is also worth remembering that a child who does not speak German and is not old enough to read the projected translations will not understand what the singers are saying. In any case, advance preparation is advisable. This “Flute” is an enthralling show, the best possible introduction to opera for nearly all ages.